Street art is a contemporary culture that is ever-growing and transitioning in significance and meaning. Street art is a contemporary culture that is ever-growing and transitioning in significance and meaning. Many artists are flooding the streets of cities around the world, leaving their masterpieces on walls and impacting the creative environment of the metropolis. Street art is a form that is both local and global, sharing its styles, techniques, and codes as a form of communication to citizens and travelers alike in a specific location. Street art is also a unique form of expression in a world that is post-photographic. Since street art is constantly changing within society, and society is what shapes many of the aspects of that art, the significance of street art messages are becoming more prominent in every day city life. Not only is street art becoming more hybridized and commonly used as a form of artistic expression, the documentation of street art in the forms of photographs and online presence is escalating at a rapid rate. Some artists even rely on the fact that their work is documented in such a fashion, expecting it to be demolished soon after completion. This documentation allows for an increased awareness and improved international reach of artistic work through the Internet, lending to a remix of culture, and hybridity of appropriating past rituals and traditions with the post-modern aspect of art. Because of the distinct remixes happening throughout the globe in various forms (varying depending on culture and subcultures), there are copious amounts of information and insightful lessons to be learned and deciphered. In the Middle East, graffiti and street art has become ever more prevalent over the past years. The street art allows visitors and viewers to view not only graffiti of images and artistic pieces of objects, but to analyze written graffiti and the messages that are meant to be shared within a particular piece. Each work of street art has unique political, economic, and social factors, illustrating the messaging and content of each work. 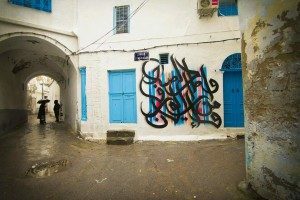 Street art in a variety of cities in that realm of the world (including main sources such as Lebanon, Tehran, and Palestine) has taken on a common attribute of frequent Arabic script and Arabic calligraphy as the main focus of street art pieces. 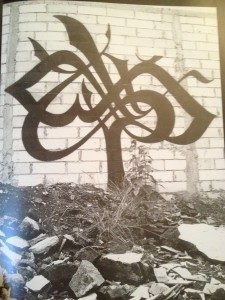 Coined “Calligraffiti,” this art form remixes the traditional principles of the Arabic script from years past with the post-modern perspective of nostalgia and visibility of documented works within society. 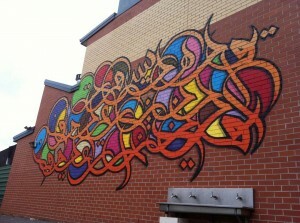 Street artist El Seed has never learned traditional calligraphy. 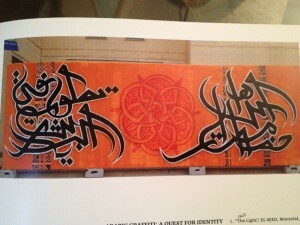 “Because of this, he prefers to define it as a form of ‘Calligraffiti’ in which the approach is much more visceral than technical: ‘Arabic script has this specific thing that gives you so much possibility in designing the letters, and I am in love with this ability to re-form and endlessly innovate.’” Furthermore, this art form is globalizing at a rapid speed, eager to take meanings and display of culture from the city of origin and disseminate it throughout major factions of the world in order to gain recognition for a specific message, movement, or unique style and implementation of street art. So what does this remix mean? Why is this specific remix of traditional calligraphy and post-modern art ideologies prevalent in today’s street artists in the Middle East? And why is the globalization of this art so rapid in dissemination? Remix of the traditional Arabic script with post-modern ideologies in conjunction with the globalization of this particular style of street art is due to several factors within the history of art and Arabic script as well as the ubiquitous aspect of today’s social communications, and attributes of the average consumer worldwide. 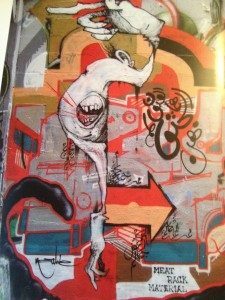 Key concepts involved, include the dissection of what calligraphy is, and what in history and phonetics made it so, as well as concepts within post-modern art that are embodied within street art (and this remix of street art, graffiti, and calligraphy). Within post-modernism, the concepts of High and low forms of culture, late capitalism, nostalgia, and history within nostalgia are referenced in order to form a better understanding of the remix principles. 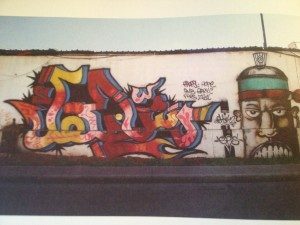 Evidence and examples in the research interpreted include an in depth look at el Seed, a Tunisian artist raised in the suburbs of Paris. Other examples related include works of art and documentation of Palestinian graffiti as well as Beirut, Paris, London, and other cities that are a factor in the globalization of street art and calligraphy (including artists such as Hest1, L’Atlas, A1one, and Native & ZenTwO). 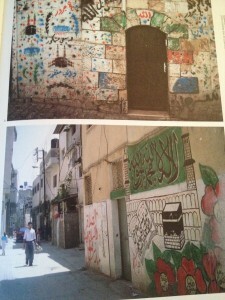 In order to understand how the remix occurred and what the remix of this style of street art is, it’s imperative to delve deeper into the technical aspects of the Arabic script and the components and specific attributes of the types of writing and the history (as well as the acknowledgement of the difference between flow and written scripture in different cultures). Originally the Arabic script was responsible for shaping the visual aspects of calligraphy and representing the Islamic religion and Holy Scripture of the Koran. This calligraphy then became reproduced, appropriated and perceived as a symbol of religion and the virtue of the ways of the Islamic faith. 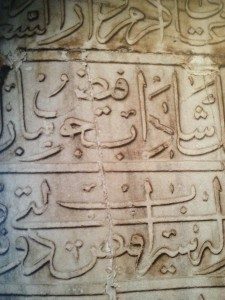 From that usage, the script was then represented in texts that were irreligious as well as on everyday objects of architecture and appearances on structures throughout cities where Arabic script was the origin of its’ linguistic practices. The artistic expression of the scriptures throughout the cities began at the birth of the original scriptures and cities. The Arabic script started from borrowing letters and symbols from surrounding regions, and then developed and honed into independent scripture and symbolic meaning through the influence of individuals, culture, and the effects of time. The writing system of Arabic and the alphabet it acquired was first developed around the system invented by the Phoenicians in 1300 BCE. According to Huda Smitshuijzen AbiFares, “As traders, the Phoenicians managed to spread the alphabet across their trade routes and port cities…the Arabic language spread via the Islamic conquests to neighboring nations, into what constitutes the Arab/Islamic nations of today.” The language became something that unified a region of the world, beginning the works of Islamic art through visual representation in symbolism and imagery. From basic script alphabet to flowing calligraphy, the development took place in the first Arab empire in Iraq in the 7th century, where two styles of fully implemented, flowing calligraphy called the Naskh and Kufic styles were developed. This calligraphy became the higher art form of the 10th century calligraphic styles. The Kufic style was the oldest and most refined art form of calligraphy. This style transcribed the Holy Koran, and in it’s original form, developed into two forms: the smoother, ‘curvilinear Maghrebi’ styles of more western regions including North Africa and Spain, and the angular flair of the eastern part of the empire. This writing wasn’t completely fluid, but rather had breaks between letters and words more frequently than that of script today. Being that the Kufic style was split in half from east and western styles, the end signature of both east and west sometimes also acquired decorative end strokes (such as making the ending of a word a flower on the last stroke, or an arabesque motif). This was the beginning of physical art within the calligraphy, adding to the artistic nuance and meaning behind the calligraphic styles themselves. Naskh style is the type of calligraphic writing that is accentuated by the fluid handwriting. This type of calligraphy was used solely for important documents, in what grew to be calligraphic cursive script for official forms. 10th century calligrapher Ibn Muqlah gave the cursive styles of the Arabic script distinct proportions (a type of ruling and order set into place for all the different styles being used). Even though the original styles included Kufic and Naskh, others developed (such as the Thuluth, Muhaqqaq, Rayhan, Tawqii, Ruqaa, Behari, Diwani, Nastaaliq, Shikasteh, and others) they were all taken from the chaos of all these different writing forms and standardized in terms of size and structure to the wide variety of styles. This was important to the times because of the homogeneity enforced by Muglah, enabling for different styles to come together to be understood by a wider variety of individuals who spoke the tongue of Arabic. This standardized, calligraphic form also allowed flexibility for when typography became a movement of the present. Typographic printing tried to embody the most popular calligraphic styles of the time. 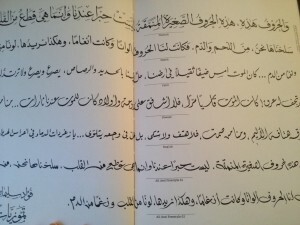 Arabic type design used the invention of the dry-transfer type, instead of the typesetting machines of that period used by the west because of the cost and the convenience (not to mention the west used a Latin typeset and font, which was not congruent with the Arabic script or alphabet). This was changed when the Internet was invented and the keyboards could be interchanged from one language to another, creating a global world culture. The idea of a new global world culture through the Internet was inspired from the number of stylistic inefficiencies in digital technologies of the west. Because of the Internet, cultures like Arabic could easily access a way of expressing their language rather than older forms of communication, increasing their representation of the script on digital media. This also opened a new attitude of stylistic experiments in terms of design (on and off the Internet) now that the dialogic of the script could be globalized. “The novelty of the Arabic fonts lies in the creation of new styles that do not fit into the traditional classifications. These designs vary from the modernist approach of ‘form follows function,’ or the opposite, which puts form before any other consideration. Some type design trends include display fonts that are expressive and playful, designed for special purposes, and often inspired by popular culture. These range from personal formal experiments to representations of vernacular street art, cartoons and comic strips” (AbiFares). The various forms of global visual communications have rapidly increased around the world. Furthermore, because of the Internet and its’ global outreach, works of art can now be documented, photographed, and dispersed across a variety of social media outlets. Street art has taken on this movement of globalization from the cities of its’ origins to the Internet and even into foreign cities, when the artists choose to further spread their artwork and ideologies behind them in other spaces of the world. The meaning of the same, but the context of the art determines the audience reached and the effectiveness of the viral ability (i.e. if viewers take pictures and uploads it to Twitter, Facebook, etc.). For example, el Seed has taken his artwork and spread it throughout Canada, Paris, Tunisia, Syria, Palestine, Greece, and others. His work has been spread across several forms of media, by viewers and artists alike. This globalization and rapid movement of taking street art to new streets around the globe, as well as the idea of traditional calligraphy is implemented by a variety of artist within the Middle East. One of the most prominent artists is an individual who calls himself, “el Seed” (his work pictured above). He uses illustrative or uncommon hybrid variations of letters and the way they are displayed within a city. He takes this traditional calligraphic form of Arabic script, and has globalized it throughout several regions of the world. 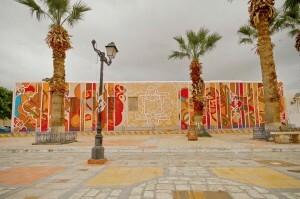 The remix that occurs in conjunction of the globalization of street art includes traditional Arabic calligraphy with post-modern ideologies. One characteristic of post-modernism is the aspect of the “Global village phenomena,” or the globalization of cultures, races, images, capital and products through art. It’s is characterized by the, “dissemination of images and information across national boundaries, a sense of erosion or breakdown of national, linguistic, ethnic, and cultural identities; a sense of a global mixing of cultures on a scale unknown to pre-information era societies.” The use of the Internet for globalization has capitalized on this idea for calligraphy and street art in the Middle East to mesh. Borders have been broken, linguistic styles have been dispersed, and the cultural identities of Middle Eastern artists have been shown through their work in various places all over the globe. Although the Internet has catapulted this aspect of post-modernism, there are other aspects this remix embodies. High and low forms of culture, late capitalism, nostalgia, and history within nostalgia are all post-modern ideologies that are remixed with the principle of traditional Arabic calligraphy in order to create a new form of street art, spread across international borders. “High” and “low” forms of culture are categorized by the type of living of individuals (and how elite that living is). For example, high culture refers to cultural products and luxuries individuals have the opportunity to have (and those products are seen as desirable), such as the aristocracy or intelligentsia. Low culture refers to art that is part of the masses, or potentially those who aren’t as well educated as those of the elite (for example, reality TV, gossip magazines, or pop music and pop culture art). The mixture of high and low forms of culture is a post-modern ideology formed through art. The fusion between street art and Arabic calligraphy is a prime example of the hybridization of forms and genres that combine high culture (calligraphy originally seen as an expression of religious freedom and elitism within written culture) and low culture (the idea of pop culture on the streets in plain sight for the masses to consume and then regurgitate via social media). Culture, histories, time periods, and contextual styles are all remixed within this specific form of art that incorporate high and low forms of culture across several points in history. Philosophers and anthropologists such as Ernest Gelner have acknowledged and supported the idea of high and low culture, but other art critics increasingly see it as political distinctions rather than an intellectual or defensible aesthetic. El Seed voices his opinion by saying, “’The revolution [in Tunisia] has created new street artists, and I believe this is a good thing as it is a way to democratize art and bring it to everyone.’ In his eyes, the ‘revolution’ also revolutionized art in Tunisia: “Before [the uprising] art was reserved for the bourgeoisie and the elite and to a large extent it still is today. 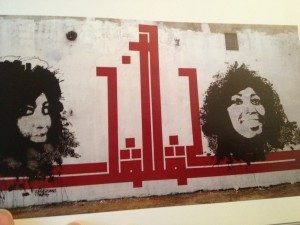 But the fact that street art was appropriated and is associated with a grassroots movement has brought a brand new dimension to the role of art in mainstream Tunisian society” (Beneat-Donald). A mixture of high and low culture that brings a ubiquitous ability of viewership for citizens, travelers, and art connoisseurs. Post-modernism also embodies the idea of “late capitalism,” or, “culture dominated by post-industrial, consumerist, multi- and trans-national capitalism, beginnings of globalization.” The consumer is a specific aspect of the ideology that is imperative to the generation and advancement of this type of remix of art. The consumerist in post-modern times is absorbed by materialistic motivations as well as the mass-production aspect of goods. In terms of post-modern art, consumers are now enamored by the idea of revealing infinite cultural aspects of humanities different than their own. Late capitalism in street art and calligraphy is enabled by the consumerist society because of the motivations in the market, which build the basis for globalization standards. The late capitalist environment is so fast paced and on demand, that it is warping time and history in a speedy fashion into the streets and cities all around the world. Lastly, post-modernism includes a concept of history that is represented through nostalgia and fantasies of the past, becoming a particular style of art. 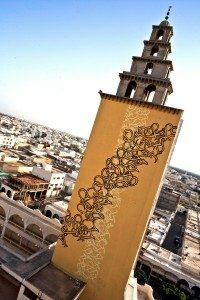 This idea is integrated into street art and the Arabic calligraphic work of Middle Eastern artists. This history is represented through nostalgic means. Arabic calligraphy, as modeled earlier, has its’ origins within the ancient times of religious context. The nostalgia comes from the long time period gone without recognition and appreciation for calligraphic text of Arabic script. Similar to the term “vintage,” or how the new generations of consumers are so interested in remembering the past. The millennial generation is known to be the most nostalgic of all time. Recycling earlier genres or styles of work, images of individuals, colors, clothing, etc. can all play into the role of nostalgia and the powerful message and history it carries. Coincidentally, many of the artists that are delving into historical contexts and participating in nostalgia are within a younger age group. 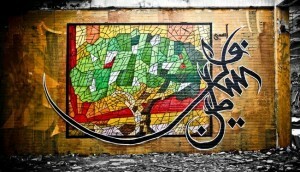 The post-modern aspects of Middle Eastern street art and calligraphy as well as the globalization have been propelled forward by artists like el Seed and others who understand the imperative nature of the Internet, and the opportunity it holds in terms of international outreach and marketing messages through their art. 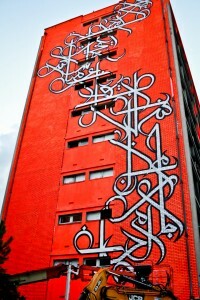 El Seed is a role model when looking for a new remix and and new type of typography for Arabic calligraphy and street art (follow him on Twitter at https://twitter.com/elseedart/media). 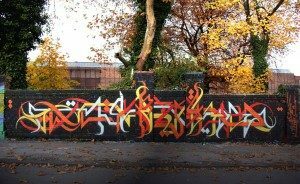 Because of his use of an ancient script in conjunction with post-modern ideologies and techniques, his new remix embodies the answer to why this globalization of street art is occurring. 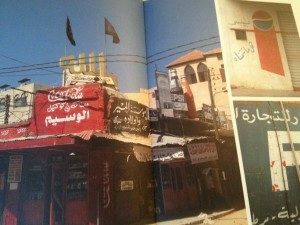 The idea of spreading beliefs and messages (whether they be political, economic, or social) can be achieved by appealing to the historic nostalgia of the ancient Arabic script, while touching on what pleases the present day consumer (in a post-photography post-modern world) by putting these messages in different cities around the globe. El Seed is not the only artist to achieve the success creating in street art graffiti and Arabic calligraphy, but he is one of the only artists to succeed in globalizing his message and becoming an icon for the new remix of present society. These messages are what increase awareness concerning events and ideas within a certain culture, allowing the whole world to see the messages being created behind what many people thought were closed doors of countries who often are the focus of political, economic, or social struggles. The fusion of calligraphy in today’s street art and its’ meaning is broadcasted into the global project of all street art and artists. The true meaning and significance behind it all, is to not only create an expression of art, but to disseminate an understanding of culture (the culture of historic scripts and the meaning of calligraphy to the culture of present day occurrences within Middle Eastern society). To curb the ignorance of global stereotypes and misinformation of the struggles and events, and produce an understanding of the everyday experiences of those whose heritage lies in the Middle East and the Arabic script. Dissecting the meaning of calligraphy, the history and phonetics, concepts of the post-modern art (high low culture, late capitalism, nostalgia/history), and identifying examples of globalization and remix are ways society can strive to understand the messages and meaning of culture within this remix of street art, graffiti, and calligraphy. Street art’s contemporary culture will continue to transition in significance and meaning. Artists will continue to flood the streets of cities around the world, leaving their mark and works of art as an impactful tool of messaging and remix. Both local and global, the future of street art is yet to be determined, but the rise of the remix of traditional calligraphy and graffiti is on the rise. The styles, techniques, and codes continue to communicate with an audience of citizens, artists, and travelers to inform and inspire, and to begin the movement of understanding in culture from the combination of cultural roots and modern day art styles on the streets. 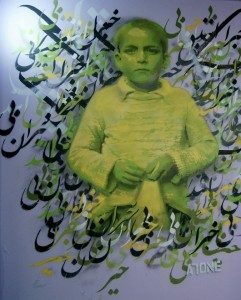 “A1one Aka تنها / Iran -Middleeast.” A1one Aka / Iran -Middleeast. N.p., May 2014. Web. 02 May 2014. <http://www.kolahstudio.com/a1one/>. Balbo, Laurie. 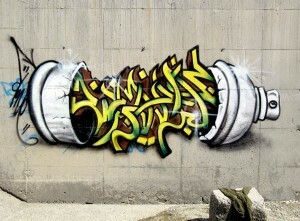 “Paris Tower “Graffed” by Arab Street Artists, Then Destroyed (VIDEO).” Green Prophet. N.p., 04 Nov. 2013. Web. 02 May 2014. <http://www.greenprophet.com/2013/11/paris-tower-graffed-by-arab-street-artists-then-destroyed-video/>. Beneat-Donald, Megan. 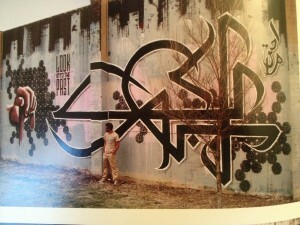 “Graffiti, Meet Arabic Calligraphy.” Fair Observer°. N.p., 17 Dec. 2012. Web. 02 May 2014. 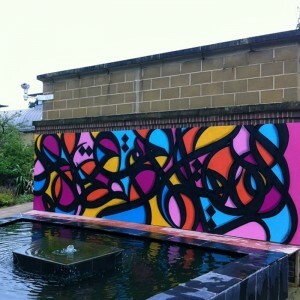 <http://www.fairobserver.com/article/graffiti-meet-arabic-calligraphy-0>. 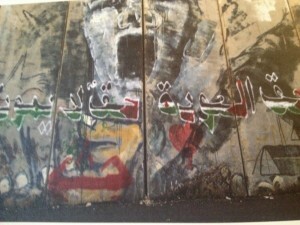 This piece focuses on the meaning of el Seed’s work and the reasons and motivations attached to his masterpieces. 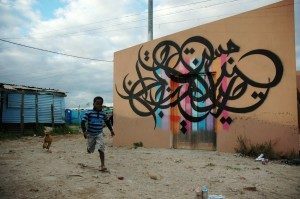 It talks of aspects of globalization and new typography in the Middle East as well as El Seed’s journey through time since he began his street artistry. Furthermore, this piece discusses the importance of expression through graffiti and street art as well as why the global aspect of this expression is imperative for others to understand the internal messaging. “EL Seed.” EL Seed. N.p., 2013. Web. 02 May 2014. 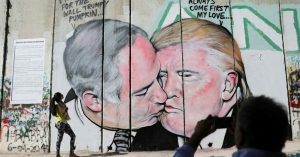 <http://elseed-art.com/>. “EL Seed Art Sale.” Inner-City Muslim Action Network. N.p., 2012. Web. 02 May 2014. <http://www.imancentral.org/el-seed-art/>. “High and Low Culture – Boundless Open Textbook.” Boundless. N.p., n.d. Web. 02 May 2014. Irvine, Martin. “The Work on the Street: Street Art and Visual Culture.” Georgetown University, n.d. Web. 15 Apr. 2014. <http://www9.georgetown.edu/faculty/irvinem/articles/Irvine-WorkontheStreet-preview.pdf>. Irvine, Martin. “The Po-Mo Page: Postmodern to Post-postmodern.” The Po-Mo Page: Postmodern to Post-postmodern. Georgetown University, 2013. Web. 01 May 2014. <http://www9.georgetown.edu/faculty/irvinem/theory/pomo.html>. This piece discusses the ideologies of a post-modern society. It covers a variety of aspects from modern to post-modern and the characteristics that make each classification such. This strongly correlates with the ideologies behind present day street art and the post-information, post-photographic society that frames a post-modern art world. This piece also addresses the ideas of anthropologists and philosophers alike and their viewpoints of the progression of post-modernism. Jameson, Fredric. “Postmodernism and Consumer Society.” Http://www9.georgetown.edu/faculty/irvinem/theory/Jameson-PoMo_and_Consumer_Society.pdf. N.p., n.d. Web. 15 Apr. 2014. 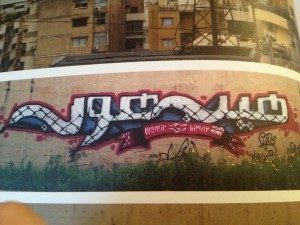 “Note.” Iranian and Arabic Graffiti and Street Art. 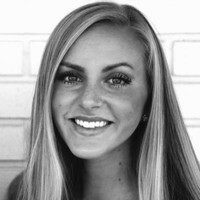 N.p., Nov. 2013. Web. 02 May 2014. <http://mideastcollective.blogspot.com/>. Zoghbi, Pascal, Stone, and Joy Hawley. 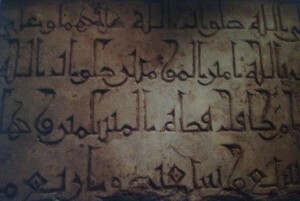 Arabic Graffiti = Gharāfītī ʻArabīyah. Beirut: From Here To Fame, 2011. Print. This work particularly focuses on all aspects of the Arabic script and calligraphy and the meaning behind it. It touches on the historical aspects of cultural scripture and how the dissemination of this culture occurred. Furthermore, this book discusses the global aspects of graffiti and calligraphy and how many different artists use this in their work today (and how each artist differs from each other depending on the place work is created). Originally published by Dr. Martin Irvine, Communication, Culture and Technology Program, Georgetown University, under the terms of a Creative Commons Attribution-NonCommercial-NoDerivs 3.0 Unported license. This entry was posted in Arabia, Art, Art History, Culture, Middle East. Bookmark the permalink.